One book, two languages, one hundred words. That's what you get with First Words: Spanish. It's a simple and accessible tool for introducing Spanish language to young children. Each word has a corresponding picture on a brightly coloured background which contrasts with the white space surrounding the words in bold type which are on the opposite page. The one hundred words featured in First Words: Spanish should be easily recognised by children just by the pictures, even if they can't read the words. There are everyday items like pieces of clothing, food, animals, types of transport, shops, places and items from around the house, greetings, and more. I showed First Words: Spanish to a native Spanish speaker and teacher who mentioned that its emphasis generally appears to be on Spanish as spoken in Spain, rather than that spoken elsewhere. An example of this would be Spain's word for car being 'coche', whereas other Spanish speakers would tend to use 'carro' or 'auto'. On the other hand, the pronunciation of some words is more in line with Spanish spoken elsewhere. So the expert opinion is that although there is some mixing of dialects, this would not be an issue for a children's book like First Words: Spanish which is a good introduction to the idea of languages in general and Spanish language in particular. I imagine this would be able to be used as a stand-alone book, but also in conjunction with reading bilingual stories, or by anyone wanting to learn a new language, whatever their age. It also has a multimedia experience, with a complementary website that offers an audio pronunciation guide. 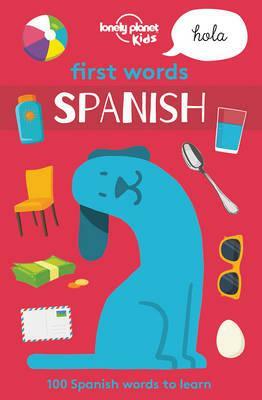 Find a copy of this libro and you'll be able to start incorporating Spanish into your day!